Tripod deployment operations funded by MARGINS. Here, a multi-instrumented tripod is being manoeuvered using Revelle's aft A-frame. 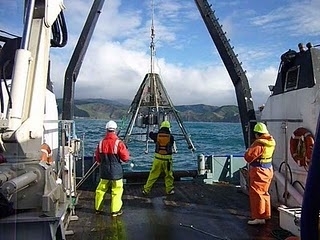 An instrument package that includes optical and acoustic backscatter devices, upward-looking ADCP and a CTD is visible in the middle of the tripod. Poverty Bay, New Zealand. Image courtesy of JP Walsh, ECU.